In 2002, recognizing that there was little hope that Congress would pass a federal law prohibiting employment discrimination based on sexual orientation and gender identity any time soon, the Human Rights Campaign (HRC), our nation’s largest LGBT civil rights organization, decided to promote workplace equality through a new Corporate Equality Index (CEI). HRC believed at the time that releasing a public scorecard that highlighted its recommended LGBT-inclusive employment policies — and ranked Fortune 500 and other large American companies based on their adoption of them — would increase the demand for equal workplace protections and benefits among America’s workers while simultaneously increasing their supply among our nation’s largest employers. As an HRC national board member, I helped the organization develop its first Corporate Equality Index in 2002. This index rated 319 large U.S. companies based on seven workplace criteria and found a median score of fifty-seven percent, a score lower than I had hoped for but higher than I had expected. My experience using this public index to promote workplace equality ultimately informed my decision to use a similar strategy to promote evidence-based policy within the federal government. Inducing federal agencies to support evidence-based programs will be a linchpin in orienting funding around outcomes. A public index could be an effective tool to spur behavior change in the federal bureaucracy. In 2012, my colleague Michele Jolin and I founded Results for America (RFA), a nonprofit organization committed to helping policymakers at all government levels build and use data and evidence to improve outcomes. We quickly discovered that there was no standard of excellence that described the “what works” infrastructure federal departments and agencies need to have in place in order to be able to use data and evidence when making budget, policy, and management decisions. We ultimately interviewed more than 60 current and former federal government leaders and key external stakeholders, who helped us develop the data and evidence criteria in our inaugural Invest in What Works Index, which we released in June 2013. Similar to HRC’s index, the primary purpose of RFA’s index was to build the demand for and supply of evidence-based policymaking at the federal level. After releasing our first four indexes in June 2013, September 2013, May 2014, and March 2015, we again worked with dozens of current and former federal policymakers and others to develop an updated index, which we released in April 2016. 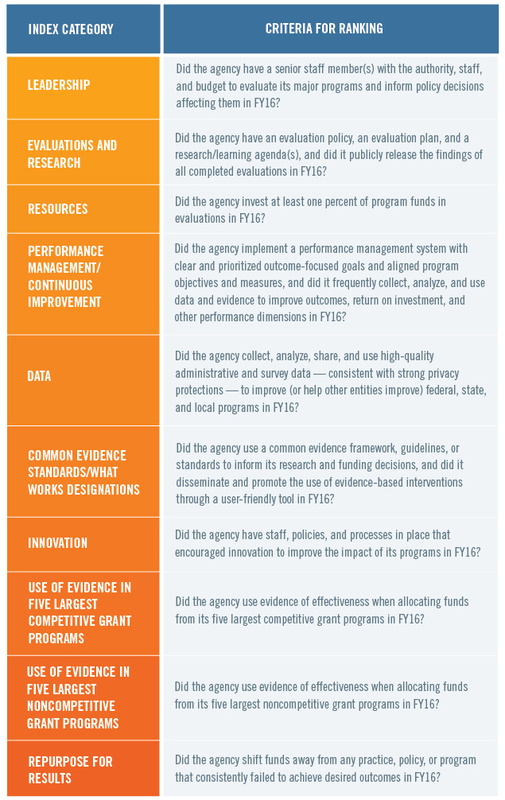 This index ranked seven federal departments and agencies1 based on ten data and evidence criteria (see Figure 1). Since 2013, our RFA team has been helping policymakers at these seven federal departments and agencies develop and implement the recommendations in our federal “standard of excellence.” For example, we helped the U.S. Department of Education and bipartisan congressional leaders make several of the federal education programs highlighted in our federal index more results-driven by developing the evidence provisions in the bipartisan 2015 Every Student Succeeds Act (ESSA). These provisions could help states and school districts shift up to $2 billion toward evidence-based, results-driven solutions annually in fiscal years 2017–20. RFA’s new Evidence in Education Lab is now helping states and school districts implement these ESSA evidence provisions to ensure that its changes in federal policy and shifts in federal funds will ultimately improve education outcomes for our nation’s young people. RFA also worked closely which the Corporation for National and Community Service which now allocates up to 12 points out of 100 to grant applicants seeking AmeriCorps funding based on their evidence of effectiveness. At RFA, we understand that developing our federal standard of excellence was just the first step. Helping government policymakers implement its recommendations as effectively and efficiently as possible and continuing to engage and mobilize them as “what works” champions are necessary to ultimately achieve desired outcomes. In 2016, the HRC reported that a record 407 of the nation’s 851 largest businesses earned a top score of 100 percent in its fourteenth annual CEI — up from just 13 corporations in 2002. RFA’s 2016 Invest in What Works Index similarly noted that the seven federal departments and agencies included in it were, on average, nearly 80 percent of the way toward meeting its ten criteria. RFA’s Invest in What Works Index and the HRC’s Corporate Equality Index point to the potential of using standards of excellence to drive behavior change in both the public and private sectors. Similar, independent initiatives such as the LEED Green Building standards have galvanized change in other sectors. In the global development realm, Transparency International’s annual Corruption Perception’s Index has helped to raise public awareness of the necessity to root out corruption, and steered governments across the world to take actions to improve their rankings. These examples indicate the potential to help accelerate progress in both the public and private sectors to evidence-based policymaking and outcomes orientation by publicly ranking organizations based on a relatively small number of objective criteria developed by a broad range of content experts. This approach can create new social norms by defining what constitutes good practice and coupling this analysis to a public campaign that celebrates early adopters and shines the light on laggards. Without waiting for legislative action, this social pressure can catalyze a healthy competition among agencies and private funders to reorient funding around outcomes. While this work is still in its early days, we are encouraged by initial progress and success of this approach in other fields, and believe this will be an important complement to other more direct actions to shift the culture and practice of social sector funding. 1 Results for America, “Federal Invest in What Works Index” (April 2016), available at http://2016.results4america.org/.